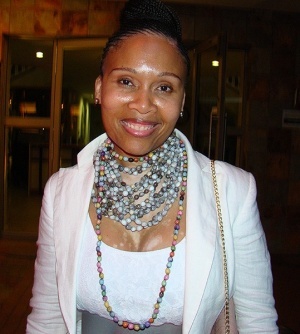 Leleti Khumalo (born 30 March 1970) is a South African film and television actress. She starred as the title character on Mbongeni Ngema's 1992 feature film Sarafina!, have previously toured with the play of the same name. In 2004 she starred as the title character in the Academy Awards award nominated Darrell Roodt film, Yesterday (2004 film). In 2005 she joined Generations to portray the character of Busi Dlomo until 2008. In 2015 Leleti Khumalo starred on Duma Ndlovu's Uzalo as Zandile "MaNzuza" Mdletshe until 2018. She currently stars as Nokubonga Bhengu on e.tv's Imbewu: The Seed. This page was last edited on 11 November 2018, at 19:01.